on friday i had lunch at medlar (just wonderful, they really deserve their new michelin star and the menu is such good value – go if you haven’t been!) and chose a vegetarian main course – gnocchi with cavolo nero, wet walnuts and reblochon. 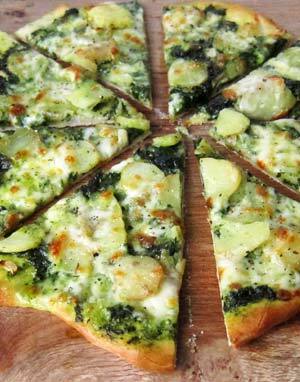 it was absolutely delicious and the inspiration for yesterday’s pizza – cavolo nero pesto smeared on the dough, topped with cooked sliced pink fir apple potatoes, a sprinkling of chopped smoked garlic and finished with a generous portion of mozzarella. 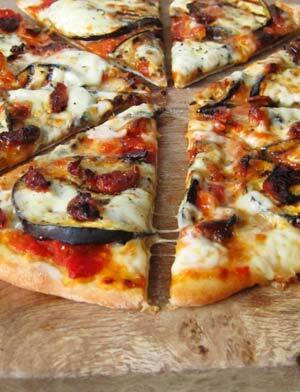 the second pizza we had was more traditional – a tomato sauce topped with griddled aubergine slices, chorizo and mozzarella – and a perfect contrast.